Kathryn Hall has been invited to serve as a Celebrity Judge at the 34th Annual John Druecker Memorial Rhododendron Show & Plant Sale to be held in Fort Bragg, California. 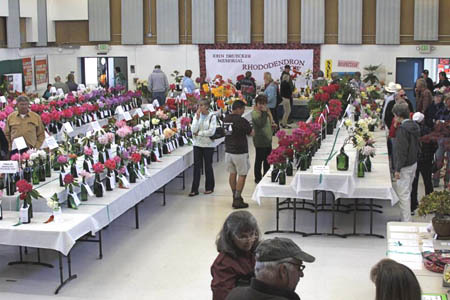 The 34th Annual John Druecker Memorial Rhododendron Show & Plant Sale will be held at Dana Gray Elementary School, 1197 Chestnut Street, Fort Bragg, California on April 30 & May 1, 2011. “Oldies But Goodies” is this year’s theme. This is a juried show, one of the largest on the west coast with over 700 entries including rhododendron flowers, pictures, bonsai and arrangements. Entries may be brought to the cafeteria on April 30 between 7:00 and 9:00 am. Members will be available to assist in filling out the short entry forms. Selections are awarded ribbons by judges from outside the area between 9:00 and 1:30. The show then opens to the public until 5:00 on Saturday, and from 10:00 to 3:30 on Sunday. Local nurserymen from Celeri & Son, Descanso, Forest Lane and Heartwood nurseries will be on hand at the sale to help select plants from 9 to 5 on Saturday, and 10 to 4 on Sunday. Additionally there will be a beautiful garden scene, an ongoing raffle, refreshments, educational displays and more! Admission is free to this truly worthwhile event.